MONROVIA – Crane Currency has categorically debunked the Presidential Investigation Team’s (PIT) report that it, in breach of the contracts with the Government of Liberia, connived with officials of the Central Bank of Liberia (CBL) to print extra banknotes at the expense of the Liberian government. 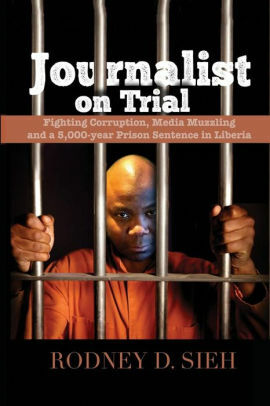 The PIT in its report stated that Crane which was contracted by the CBL in two separate contracts to print banknotes totaling L$15 billion at the cost of US$15,331,689.20 conspired with officials of the CBL to defraud the Government of Liberia by ignoring the terms and conditions of the contract and went ahead to print L$18,151,000,000 in breach of the contract. The Government of Liberia incurred an extra printing cost of US$835,367.78. The PIT found Milton Weeks, former Governor of the Central Bank, Charles Sirleaf, Deputy Governor for Operations, Hagba Dorbor, director of banking, Richard H. Walker and Joseph Dennis liable of conniving to conceal the true nature of the total and actual amount of Liberian dollar banknotes printed and received by the CBL. They were all arrested upon the release of the report on February 29. Currently, they face charges of economic sabotage, criminal conspiracy and Misuse of Public Money, Property or Records and Illegal Disbursement and Expenditure of Public Money. Crane, according to the Ministry of Justice, faces the same charges. But in its response to the PIT report, a copy of which FrontPageAfrica has obtained, Crane explained that it entered into the two printing contracts in reasonable reliance on the CBL’s apparent authority to lawfully award and enter into the subject contracts. The printing house insisted that it at all points worked with the CBL to enter into and perform under the contract and to agree to all changes in writing. Crane further explained in its response that each contract, one signed on May 6, 2016 for the printing of L$5 billion and the later on July 28, 2017 for the printing of L$10 billion, was subsequently amended by mutual agreement in writing between they and CBL to include the delivery of additional over-produced banknotes and to reflect changes in CBL’s shipping requirements (e.g. by airfreight rather than by sea, to accommodate the CBL’s accelerated schedule). According to Crane, all changes to the contracts were memorialized in exchanges of letters, emails and invoice statements. 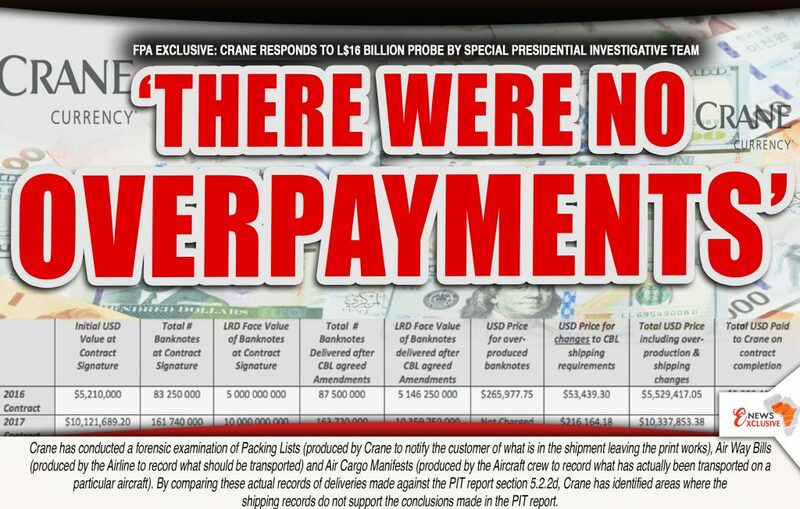 First of all, Crane disputed that it illegally overprinted an excess of over L$3 billion at the extra cost of US$835,367.78 as mentioned by the PIT. According to the printing house, all contract amendments were memorialized in email exchanges between Crane and the CBL to cover additional banknote deliveries and changes to shipping requirements. Crane noted that there was mutual consent with respect to the additionally produced banknotes. Crane stated in its response that copies of the emails and other communications with respect to the amendments of the contract were given to Kroll and the PIT. The company noted contrary to the PIT report that it printed and delivered L$18,151,000,000 in breach of the L$15 billion agreement, it in reality delivered a total of 251,220,000 banknotes worth L$15,506,000,000, which is broken down into the different denominations. Being the first time printing for Liberia, Crane said it was difficult estimating the production margin for error. However, production happened to be better than expected, thereby, generating excess banknotes. The PIT report stated that an examination of the air and seaway bills, along with the packing lists clearly established that Crane printed L$18.6 billion in banknotes above the agreed L$15 billion it was contracted to print. Kroll’s report indicated that Crane printed and delivered L$15,506,000,000. According to Crane, the PIT wrongly stated that 2700 million Liberian Dollars and 417,5 million Liberian dollars in banknotes were delivered, totaling 3117,5 million Liberian dollars. “The shipping and packing records agree that in fact only 472,5 MLRD of banknotes were delivered. This error has led PIT to conclude that Crane has shipped [3117,5 – 472,5] = 2645 MLRD more banknotes than CBL actually received,” Crane further explained. Brussels Airways cancelled its flights on December 13 and December 21 due to issues at Brussels airport. The cancellation of the flights led to the cancellation of two shipments totaling L$3117.5 million, Crane explained. Brussels airport staff, accordingly, divided the two planned air cargo loads into three new air cargo shipments. Two of the shipments, for 472,5 MLRD and 620 MLRD, were shipped by Brussels Airlines to Monrovia in a different configuration than originally planned, Crane indicated. According to Crane, Brussels sought to deliver the remainder of the goods before an announced strike at Brussels airport, therefor, the remaining volume of 2025 MLRD (AWB UKL-100019284) was delivered on-board a chartered aircraft from Ukrainian Air Alliance. For completeness, this is the same flight that also contained two separate shipments: 270 MLRD (AWB UKL-10019295) and 232,5 MLRD (AWB UKL10019306).